This healthy energy bites recipe is not only vegan and no bake, but crazy delicious! 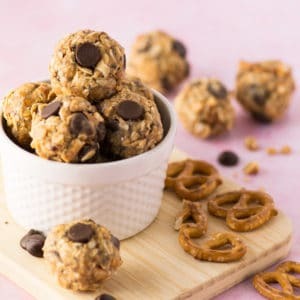 Oats, chia seeds and sweetener paired with chocolate chips, peanut butter, and pretzels make the most perfect sweet and salty high-protein snack. In a medium-sized mixing bowl, combine all ingredients. Mix well using a rubber spatula. Make energy bites into golf ball-sized balls using your hands. Gently press chocolate chips into balls (point side down) to get the chocolate chips around the outside like in the pictures. This is also optional. Leftovers keep for about 7 days in the fridge.